Nautilus Systems, Inc. has developed specialized systems specific to the Pharmaceutical and Healthcare market that provide provide features and performance that is available only through our products. We have configured a special version of our PL Applicator products specifically to meet needs in the Pharma, Life Scences, and Healthcare industry. 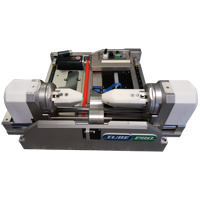 This PL Applicator includes a specialized vacuum chuck configuration that allows us to feed and inspect a label ‘just in time’ as that label is to be applied. Any labels that fail the optional inspection can then be handled by the Vacuum Chuck and placed in a controlled location for automatic handling such that labels are always controlled. 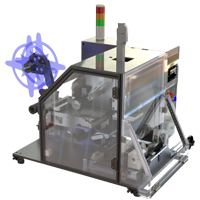 For more information about the PL APPLICATOR WITH AUTO REJECT OPTIONS CLICK HERE. Cylindrical devices, such as Syringes or Injectors, are common in the Pharma market. These devices can include very stringent labeling requirements including application of labels and wrapping of labels around the circumference of the Device. For more information about the CYLINDRICAL DEVICE LABEL WRAP MODULES CLICK HERE. Non-Cylindrical device shapes are also used in the Pharma and Healthcare market. These devices can include very stringent labeling requirements including application of labels and wrapping of labels around the circumference of the Device. Non-Cylindrical devices present very unique challenges for label wrapping specifically to ensure that the label is applied correctly and tightly around all of the surfaces of the Device. For more information about the NON‐CYLINDRICAL DEVICE LABEL WRAP MODULES CLICK HERE.